Bold and delightful, exterior spaces decorated with red ooze character. A powerful colour like red makes a statement associated with a variety of meanings: love, strength, vibrancy and determination, just to name a few. In this case, a red freestanding retractable canopy at this North York home signifies that it’s time to eat. 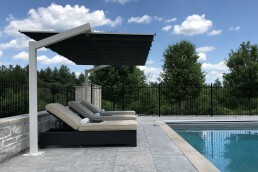 Solda Pools Ltd. ensures a superior finish on all of their projects. 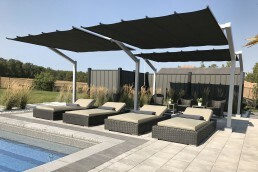 Constructing award-winning pools, spas, and landscapes, they design backyard retreats that many desire. 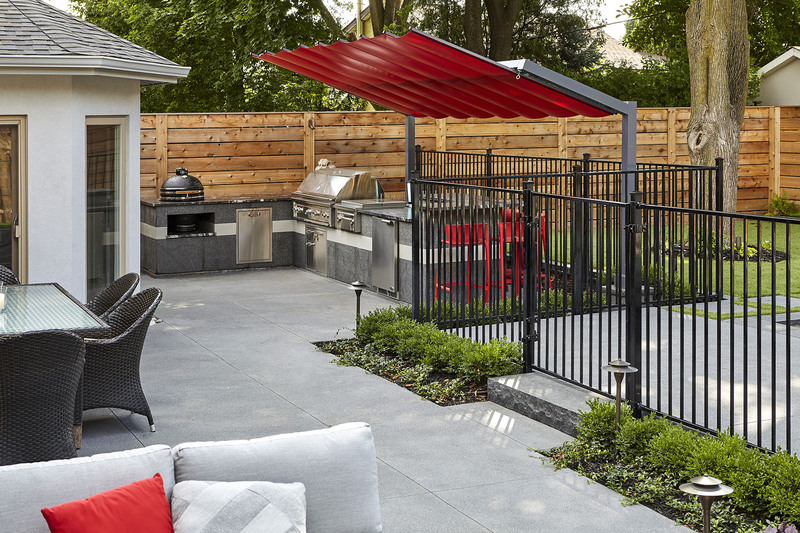 Looking to cover an outdoor barbecue with a minimal structure and maximum protection, ShadeFX fabricated and installed a two-post freestanding retractable canopy. 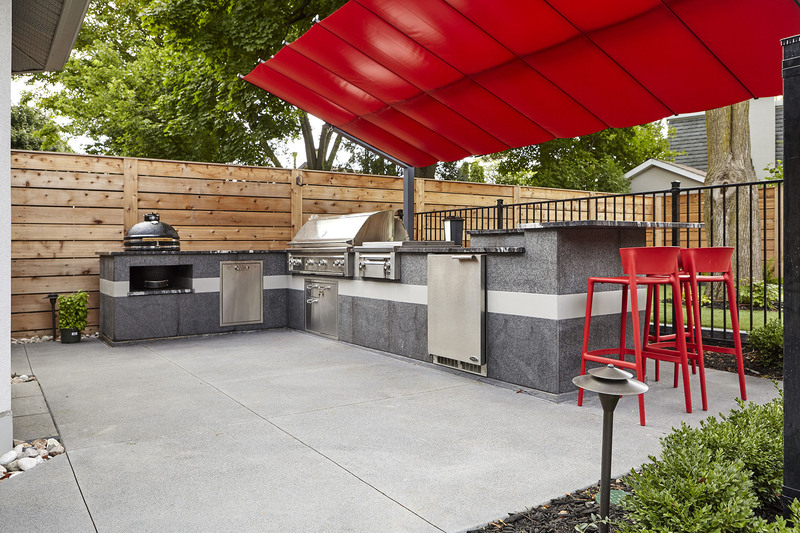 Powder-coated a slate grey, the 16′ x 8′ structure matches the details of the custom-built barbeque station. 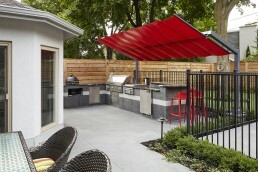 Nestled above the counters, the three-tilt red canopy serves as a focal point and weather protection. 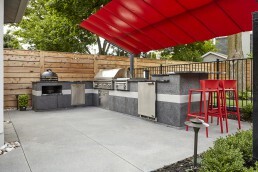 As a result, the open concept and seamless design work perfectly for this outdoor kitchen. “As this was our first encounter with ShadeFX, we took a cautious approach to their products. 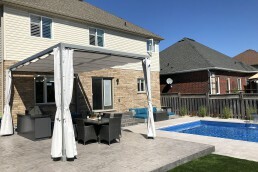 After engaging with them for a project in North York we knew right away that their service was of the highest standard. Questions we had about their products were answered quickly and effectively, samples were obtained for our client and their responsiveness to our needs were met immediately. The creative colour combination proves that less is more. 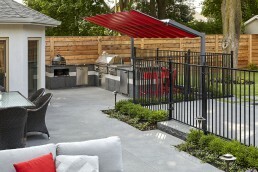 Pops of vibrant red throughout the landscaping provide lots of energy and personality. Whether the sun is east or west, the cook is always protected. As soon as the canopy is extended, friends and family know the grill master is at work. Without delay, similar to a chime of a bell, the fiery freestanding canopy has guests rushing to the dinner table. Whether its fiery red or cool blue, we have fabrics to suit your style. Let us help. ShadeFX custom fabricated a 16’ x 8’ Freestanding Canopy in a daring Arcade FR Red. 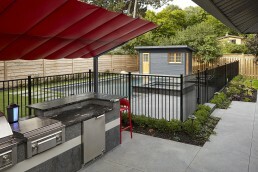 The two-post Slate Grey structure provides an open concept with minimal structure and maximum protection.